Invisalign is an orthodontic brace system that uses clear plastic aligners (almost invisible) to treat crooked teeth, crowded teeth and close gaps between teeth. One of the main benefits of Invisalign is that the aligners are made from a clear plastic so that you can undergo orthodontic treatment without having bulky brackets or metal wires showing. 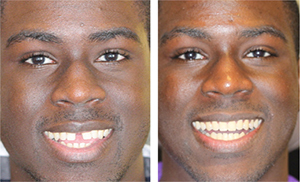 The treatment is so discreet that they are often called invisible braces. If you are considering treatment with Invisalign invisible braces you will first need to find yourself an Invisalign certified orthodontist or dentist in order to have an initial consultation. At some clinics the initial Invisalign consultation is free of charge. During your Invisalign consultation you will have your teeth examined and be given the chance to ask any questions that you have. Your dentist will give you an indication of expected timescales and costs of treatment. If you decide to go ahead with the treatment you will have a series of diagnostic records taken for which there is usually a fee. These will include X-rays, photographs and a series of impressions from which replica moulds of your teeth are made. These diagnostic records are sent to the Invisalign laboratory in America where under the guidance of an orthodontist a computer generated treatment animation is produced, which will show the movement of your teeth over the estimated treatment time. This 3D animation is called a Clincheck. Once the Clincheck has been produced your dentist will either email you a copy to see or you will be shown it at your next appointment. You will see the Clincheck at your next appointment and, provided you are happy with the 3D simulation of your tooth movement, your aligners will be ordered from the laboratory. Using your diagnostic records your Invisalign aligners are custom fabricated for your treatment and sent to your dentist. The process of sending your records to the laboratory and the production of your aligners takes between 2 – 4 weeks. At your next appointment your Invisalign aligners will be fitted to your teeth. You may need to have some attachments (buttons) fitted to your teeth in order for the aligners to stay in place. These attachments are made from tooth coloured composite material. Your dentist will show you how to wear the aligners and give you instructions on how to look after them and clean them. You must wear them for at least 20 hours a day but you can remove them to eat, drink and clean your teeth. You will change your aligners approximately every 2 weeks and they will gradually move your teeth over time. Each new set of aligners will feel tight when you first wear them but will then become loose over 2 weeks as your teeth move. You will have a review appointment with your dentist approximately every 6 weeks in order to assess progress. You may need new attachments and IPR (interproximal reduction) at these appointments. IPR is the process of stripping a small amount of tooth surface between neighbouring teeth in order to create the minimal space required for your teeth to move. Occasionally your teeth do not move in the exact way that Clincheck had predicted and you may need an adjustment to your treatment plan mid-way through the treatment. This is what is known as a mid-case correction. The cost of this is usually included in the price but do ask your dentist. With some Invisalign treatments the movement of teeth doesn't reach the desired final position and you may need some final "refinement aligners" before your treatment is complete. Once your teeth have reached their desired position your treatment is complete and you will be provided with a removal retainer or have a fixed retainer fitted to the inside surfaces of your teeth (lingual) in order to stop your teeth moving back. What are the advantages of Invisalign invisible braces? The clear plastic aligners are virtually invisible, with no metal brackets or gaudy elastic bands. This eliminates the element of embarrassment most people feel about wearing braces, and makes them more suitable for adults, among whom braces are less common. The aligners are more comfortable than traditional metal braces and less likely to cause gum irritation, because there are no metal brackets to catch on your gum tissue. The aligners are removable which makes eating, drinking and attending social events without the aligners much easier. Oral hygiene during orthodontic treatment is also much better compared to traditional braces as the aligners are removed to clean your teeth. What are the Disadvantages of Invisalign Aligners? Invisalign aligners are not suitable for treating all types of orthodontic problems and traditional metal braces may be required for more severe orthodontic problems. Invisalign is expensive because of the high quality and level of technology involved. The aligners also have to be changed every two weeks, which can be a hassle for some people. If you forget to wear your aligners the treatment will not work or will take longer; this is not a problem with fixed metal braces that are not removable. What questions should I ask during the Invisalign consultation? Can I have input into my Invisalign Clincheck, which determines the final position of my teeth? How long after seeing the Clincheck will it take to receive my first set of aligners? How often will I be seen for review appointments and are these appointments included in the cost? Will I be seen by a dentist / orthodontist at every appointment or will it be a nurse? Will I see the same dentist for all my appointments? Will any mid-case corrections be included in the quoted price? Will any end of treatment refinements be included in the price quoted? Are retainers included in the price quoted? Do Invisalign invisible braces hurt? No, though some people may find them to feel slightly uncomfortable or tight at the beginning of the treatment. Yes, initially the treatment may affect your speech and the way you talk but eventually you will get used to it and it won't have an impact on your speech. If you are involved in public speaking you can always remove the aligners for such events.